What Are Arbroath Smokies and How Are They Used? No visit to East Scotland is complete without a visit to Arbroath and the chance to eat Arbroath smokies in this fishing town. These haddock are salt-dried and hot-smoked. They can be eaten cold or warm or used in a variety of recipes employing smoked fish. The Arbroath smokie is haddock, smoked over hardwood, in and around the small fishing town of Arbroath, Angus (Forfarshire) in east Scotland. The result is a fully-cooked and ready-to-use smoked fish, usually weighing 12 to 19 ounces and measuring about 1 foot long. The smokie has Protected Geographical Indication (PGI) status under European law and can only be called an Arbroath smokie if it is produced in the traditional manner and within a 5-mile radius of the town. 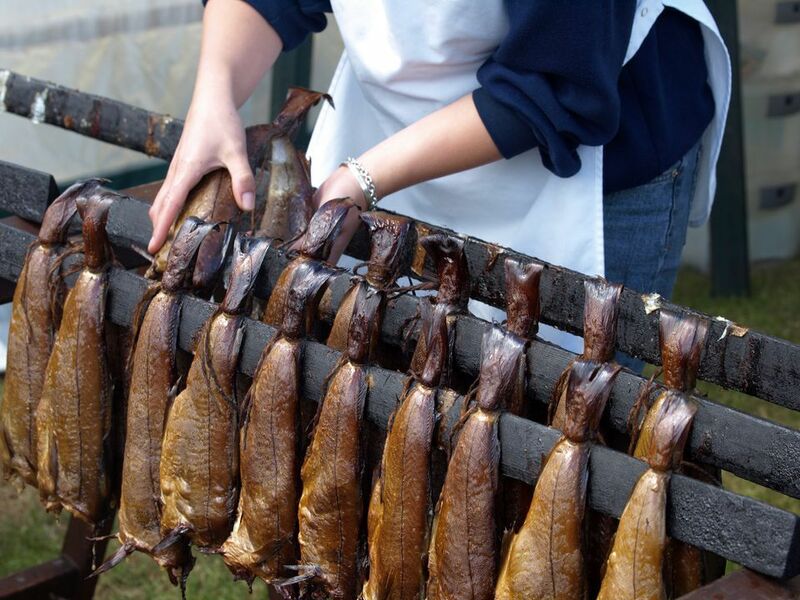 What Does an Arbroath Smokie Taste Like? The Arboath smokie has a pronounced smoke aroma, as well as a smoked flavor, almost sweet, with a bit of salt. The outside of the fish is dry while the flesh is cream-colored, moist, and flaky. Aficionados say the flavor has more depth than other types of smoked haddock. Arbroath smokies are made from haddock, a mild saltwater fish from the North Atlantic. They are hot-smoked and ready to eat without further cooking. Kippers are produced by cold-smoking herring, which is a much oilier fish and it is bonier than haddock as well. Kippers must be cooked before they are eaten. Another Scottish specialty, Finnan haddie, is a cold-smoked haddock, and similar to kippers it must be cooked further before being served. Before Arbroath smokies were given PGI status, producers made imitations that were smoked in electric kilns. With PGI status in 2004, the traditional process was ensured. The smokie is produced by tying the tail end of two, salt dried haddock together, which are then hung over sticks. A smokie pit is prepared by setting a half whiskey barrel into the ground. The base of the barrel is lined with slates to protect it, and a hardwood fire of beech and oak is lit inside. The sticks of haddock are then placed over the smoking pit and then, with the true art of the smoker, cooked until the golden-copper tones of a true Arbroath Smokie are achieved. PGI status comes from the European Union (EU), which has a process in place to protect precious foods that can be easily copied or are in danger of being lost. The EU Protected Food Name identifies these foods and where their authenticity and origin can be guaranteed and grants them protection against imitation. An Arbroath smokie can be eaten just as any smoked fish, including as a regular breakfast kipper or in soups or chowders. It can be enjoyed cold, as in a pate, or poached, grilled, or included in pasta dishes or omelets. Arbroath smokies must come from Arbroath, so a trip to this small fishing town on the east coast on Forfarshire is the best way to enjoy them fresh from the smoker. These producers can ship throughout the U.K. and may ship the fish either freshly smoked or frozen. They are available in the U.S. through specialty importers, frozen and in pairs, and might be found at British gourmet shops. Once smoked, Arbroath smokies can be kept refrigerated for up to seven days. If you want to keep them longer, freeze them in a tightly sealed freezer bag as soon as possible, preferably on the date of purchase. They will be of the best quality for three months when frozen. To use the frozen Arbroath smokies, thaw the fish overnight in the refrigerator. Smoked haddock has about 100 calories per 3-ounce serving. It is high in protein, with a single serving providing about 18 grams, which is a third of the daily value. It is very low in fat with about 1.5 grams per serving and relatively high in cholesterol, with about 60 milligrams per serving. As the fish is salt-dried, it has a significant amount of sodium, over 600 milligrams per serving. Haddock is less oily than fish such as salmon or herring, so while it provides beneficial omega-3 fatty acids, they are less than 200 milligrams per serving. Because haddock is lower in mercury than larger fish, it can be safely eaten two to three times per week. Haddock is also a good source of vitamin B6, B12, magnesium, niacin, phosphorus, and selenium.